For sale is an excellent condition 44mm stainless steel Hublot Big Bang Evolution. The 301.SX.130.SX comes with box, hang tag, polishing cloth, manuals, and warranty card. The Big Bang has a brushed and polished fixed steel bezel, black dial with applied hour indicators and is on a steel bracelet. The brushed and polished steel bracelet has black resin insides that match the lateral inserts in the case. The Hublot is currently sized to fit a 7.5 inch wrist and has a push button invisible fold over clasp. 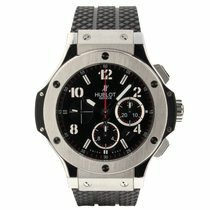 Hublot BIG BANG 44 MM STEEL "p"